Why to choose our APHQUA InstaPot Steam Release set? 1)Healthy and safe>>>All parts are made from food grade silicone, BPA-free and high-temperature resistance. 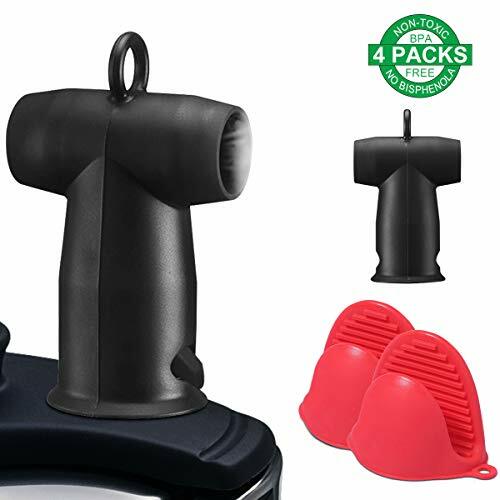 2)4 Packs Accessories>>> Comes with 2PCS Black Steam Diverters and 2OCS Red Oven Mitts,a necessary kitchen instantpot accessories set for you! 3)Stands Up Straight>>>2 Outputs keep the Steam go fast and Pipe balance without lean as similar product on the market. 4)Compatible with more models>>>All Duo, Smart and Ultra models of Mini, 5qt ,6qt or 8qt size will be well fitted.Not fit Lux Model. 5)Dishwasher Safe>>>Easy to hands clean and diswasher safe.Hanging hook design always keep your kitchen tool clean when using or finish using. 6)2 Holes Easy to USE>>>There are holes on the front and back of the accessory, so play around with it and put it on in the direction that is most useful for your needs. How to use the InstaPot Steam Diverter Release? Step1. Before cooking, fit the diverter on Instant Pot steam release valve. Step2.Turn steam release handle to sealing position, then start cooking. Step3. When the cooking cycle has finished, pinch hang hole position of the diverter and turn the steam release valve to the venting position. Step4.The diverter will redirect hot steam to the counter rather than the cabinet until the float valve drops down. #1.This steam diverter is designed for Instapot electric pressure cooker. If you want to use it on other pressure cookers, please check your knob size or consult us before your purchase. #2.Make sure your steam valve is sitting flat after putting this accessory on. #3.Since the steam in extremely hot and can cause scalds, when in releasing pressure DO NOT place hand, face and other unproected skin over the steam release valve and the diverter. ❤[UPGRADE Steam Diverter] Unlike traditional products, this instant pot steam release uses a symmetrical vertical air outlet design. 2 Outputs keep the Steam go fast and Pipe balance without lean. Keep your kitchen clean ! If you have any questions about this product by aphqua, contact us by completing and submitting the form below. If you are looking for a specif part number, please include it with your message.